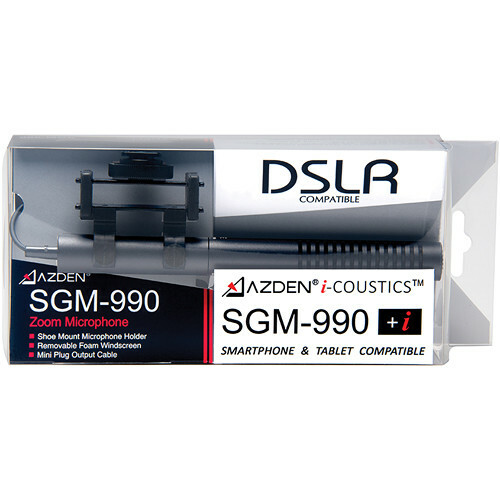 The SGM-990+i Shotgun Microphone for Mobile Device Recording from Azden is used to capture audio in critical applications such as meetings, weddings, TV sound and more. It is also compatible with smartphones and tablets with a TRRS headset jack. It is used on video camcorders, DSLR cameras, or field recorders to capture audio. It features a supercardioid pickup pattern and has a 2-position switch that allows you to widen or narrow the pickup field. It features a frequency response of 150 Hz to 18 kHz. 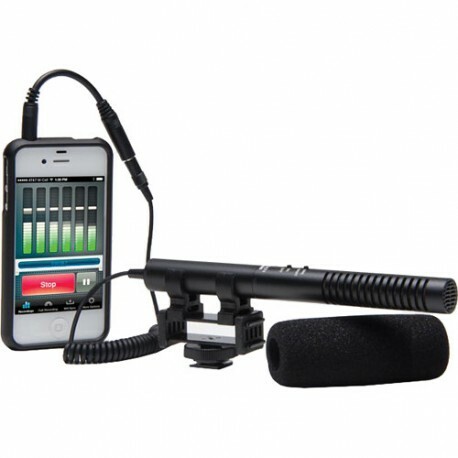 This electret condenser microphone is built with a coiled cable and has a 1/8″ mini-jack connector making it compatible with several mobile devices. It has a pickup range of 35′ and uses one alkaline AAA battery for power. A windscreen, shoe mount, 2″ interface cable, and hook-and-loop mounting tape are included. Categories: Azden, Mics, Pro Audio. 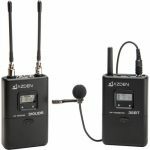 The Azden 330LT UHF On-Camera Dual Bodypack System is a powerful dual-channel UHF wireless microphone system for camera-mount applications. 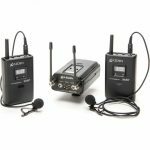 The system consists of two Azden 35BT bodypack transmitters, EX-503 lavalier microphones, and 330UPR portable dual-channel diversity receiver. The inclusion of both bodypacks allows users to operate both microphones simultaneously. The Azden 310LT UHF On-Camera Bodypack System is a powerful yet affordable UHF wireless microphone system for camera-mount applications. The system consists of Azden’s 35BT bodypack transmitter, EX-503L lavalier microphone and 310UDR camera-mount diversity receiver. With a feature set that includes 188 user selectable UHF frequencies, pivoting high-gain diversity antennas, and LCD digital display, the 310LT is guaranteed to meet the demands of consumer and professional video applications alike. The 310UDR receiver features main and headphone monitor outputs, and a removable shoe-mount adapter. Both the transmitter and receiver operate on standard AA alkaline batteries (not included). 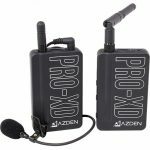 The PRO-XD from Azden is a 2.4 GHz digital wireless lavalier system that has over a 100′ range with automatic frequency scan and sync capabilities. It can be used to capture audio in several environments for applications such as camcorders, DSLR, mobile devices, recorders, and more. 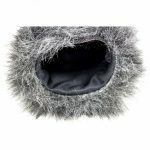 The SWS-15 Furry Windshield Cover from Azden was designed specifically for the SMX-15 microphone to provide maximum protection against wind noise in outdoor environments. The cover is made to slip over the SMX-15’s included, custom-fit foam windscreen and delivers acoustically transparent results.